appointed with a stone fireplace. What’s unique is how the project was delivered. 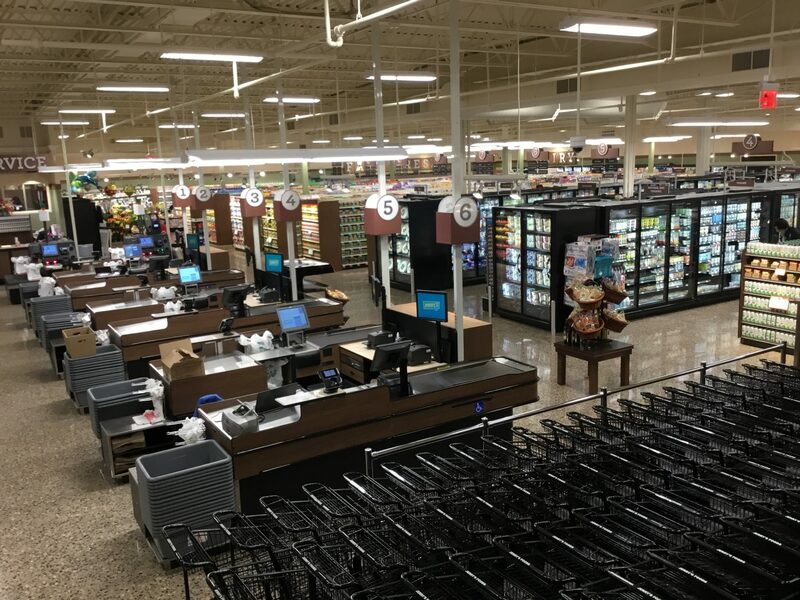 While extensive grocery remodels typically are completed in phases in order to keep the store open to customers, Jerry’s Foods made the highly unusual decision to close for the duration of construction. The majority of the 38,000 s.f. complete interior renovation was completed in just nine weeks, thanks to thoughtful planning and excellent collaboration among the client and project team. Timelapse of the Jerry’s Foods project. Q: Give us some background into the goals for this project. 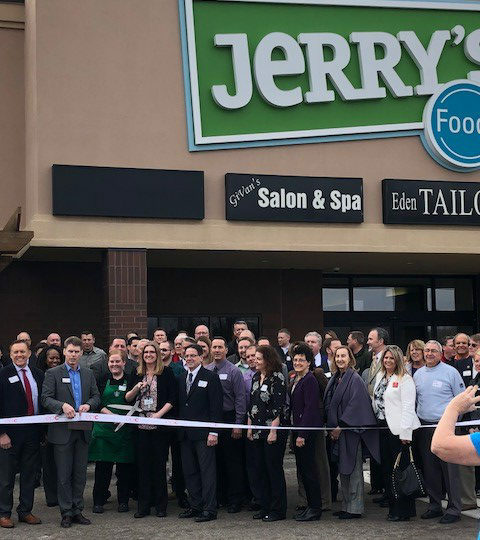 MIKE JUTZ, VICE PRESIDENT, FACILITIES & EQUIPMENT, JERRY’S FOODS: Of the stores with the Jerry’s Foods banner, the Eden Prairie store certainly did not have the appeal or offering of the other locations. A few years ago we re-invented the Jerry’s Foods store in Edina. This was followed by a brand new Jerry’s in Woodbury that opened three years ago. 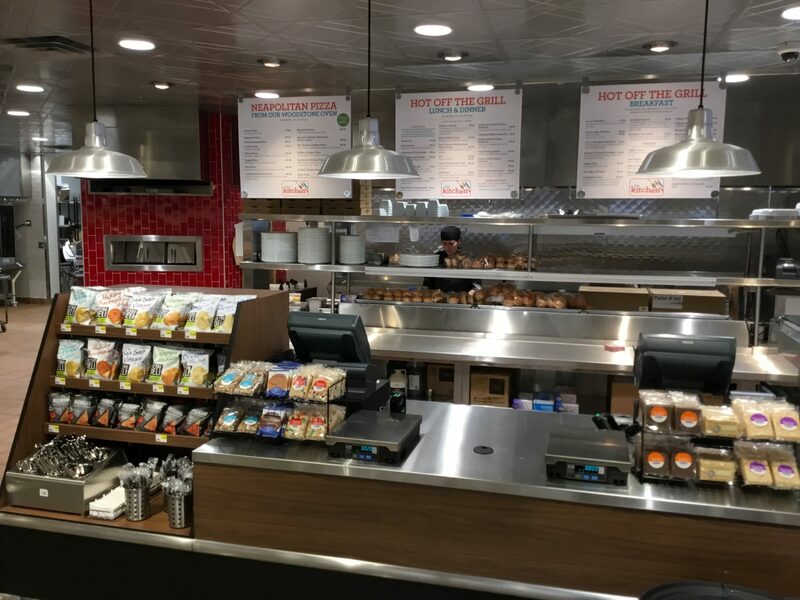 Both the major remodel in Edina and the new Woodbury store were done by KA, with superintendent Rob Sticha in charge of both projects. The Eden Prairie store originally opened in 1980. 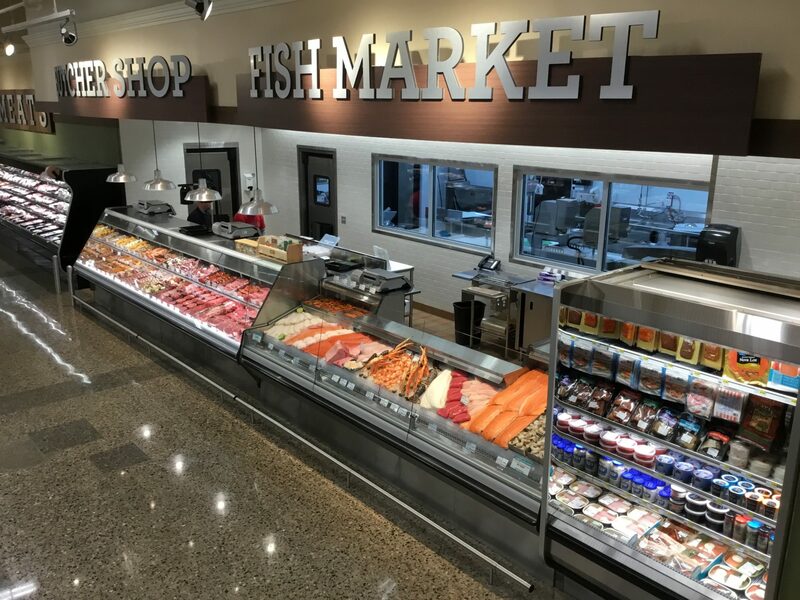 It had been remodeled over the years but was frankly outdated and needed to undergo a major remodel in order to bring it in line with what we were offering in Edina and Woodbury. 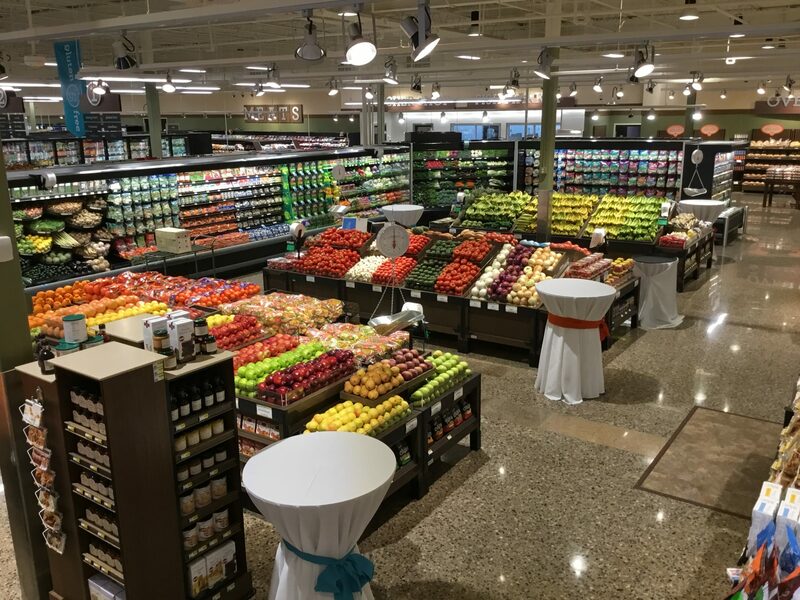 It did not necessarily need to be larger; the space just needed to be utilized in a way that reflected grocery retail today, rather than the 1980’s. Q: What was at stake? MIKE JUTZ: We obviously knew the neighborhood well since we had been operating there for over 35 years. We came to the conclusion that there were plenty of customers close by if we could just provide them a store that they felt was “theirs.” The risk obviously was that this was not going to be a relatively inexpensive surface remodel but rather was going to require a significant investment in the facility, equipment and personnel. Q: How did the decision come about to close the store entirely during construction? JEFF MAUSER: We began pre-construction meetings with the owner, architectural/design team, and MEP subs in June/July 2017. The first month or so of planning was based on phasing the work out while the store remained open. The list of challenges in doing this kept growing, such as; removal of two layers of floor tile and mastic, complete demolition of existing walls, finishes, MEP, kitchen equipment, relocation of various departments, approximately 3,500 s.f. of concrete cutting/removal for freezer slabs and plumbing trench, mostly all new refrigeration cases, coolers and refrigeration line; all while maintaining the requirements of the Health Department. Finally, Mike Jutz decided to take a shot and ask to shut the store down. Surprisingly, it was approved. MIKE JUTZ: This decision did not come about easily as you can imagine. It is the first project in my career that I made the recommendation to close in order to remodel. That just is not done in an open, operating store. As the construction and design team met, it became apparent that with the amount of work required, that this was going to be a long and disruptive remodel. The more we discussed it, we could not find a clear path to achieving this in anything less that 10-12 months. It would not only involve a long time frame, but would be very disruptive to the customers. In fact, we very likely were going to make it so difficult to shop that even our loyal customers would find that it was just not worth the effort. Closing also afforded us the chance to move departments around to achieve exactly what we were looking for instead of having to make compromises in the design. Q: Talk about the schedule. JEFF MAUSER: We started mid-October with the few items that the Health Department permitted us to do prior to shut-down, including; removing existing ceiling tile throughout sales floor area (done off-hours), build new dairy cooler in back of store, and begin construction of four other cooler/freezers in the adjacent, vacant tenant space that Jerry’s was expanding into, and bathroom renovations. The remainder of the work was completed while the store was shut down between January 2 and Substantial Completion on March 2. Q: How did you accomplish the scope of work in this amount of time? JEFF MAUSER: Once it was determined we would be shutting the store down, we began isolating and prioritizing areas of the store along with work scopes. We determined end dates that needed to be met at certain areas in order to allow enough time for refrigeration, kitchen equipment, and inspections to be installed/completed on the back end. From this we created a phasing plan. We determined the trades that we knew would need to work double shifts from the get go, and we were prepared to run double shifts with all other trades, if needed. I think this helped give Project Superintendent Rob Sticha some flexibility to speed things up wherever and whenever he saw fit. Most of the credit for coordinating and maintaining the schedule goes to Rob Sticha. Rob’s is very organized and has the respect of everyone onsite. Q: What were the major challenges in taking this approach? MIKE JUTZ: The challenges came in the need to plan virtually every step of the project before ever beginning. Essentially every construction and equipment decision had to be made up front, as there was just no time once the doors closed. The process was so unique for myself and the construction team that I think every contractor involved took it as a personal challenge to figure out the best, most efficient way to approach this project. I will say, that I would never have attempted this without having KA and a tremendous group of sub-contractors by my side that have been working with me for years. Q: How did the client relationship facilitate project success? JEFF MAUSER: There were many scope changes throughout the 9 weeks of construction during the shutdown, some of which were fairly substantial. Mike Jutz made multiple site visits every day. He would consult with the team/different trades on site and make decisions on the spot. This was very helpful in keeping the project moving forward, and was only an option because of the relationship and trust that has been built over the years between KA, Mike Jutz, and the group of subcontractors. Q: How did the project team support your goals? JEFF MAUSER: KA laborers and carpenters completed the demolition and carpentry. The demolition was complete in the first week, with 10 KA laborers on the day shift followed by 10 at night. Having these resources that you can rely on, in house, is invaluable. MIKE JUTZ: Attacking a project in this manner requires a tremendous level of trust from all involved. There is just not time to evaluate each and every situation that arises, reach out to the subs, gather the information, and then present the best options and pricing. Every hour on this project was like a day on a normal remodel. KA and the subs all bought in immediately and issues were discussed as soon as they presented themselves, options were discussed, general costs were applied to each option and a final decision was arrived at usually within minutes. Jeff Mauser had everything he could do to keep the paperwork flowing at least close to the pace of the project and Rob Sticha was the glue that held this all together. I would not have believed what could be done until I lived it myself. Absolutely amazing. 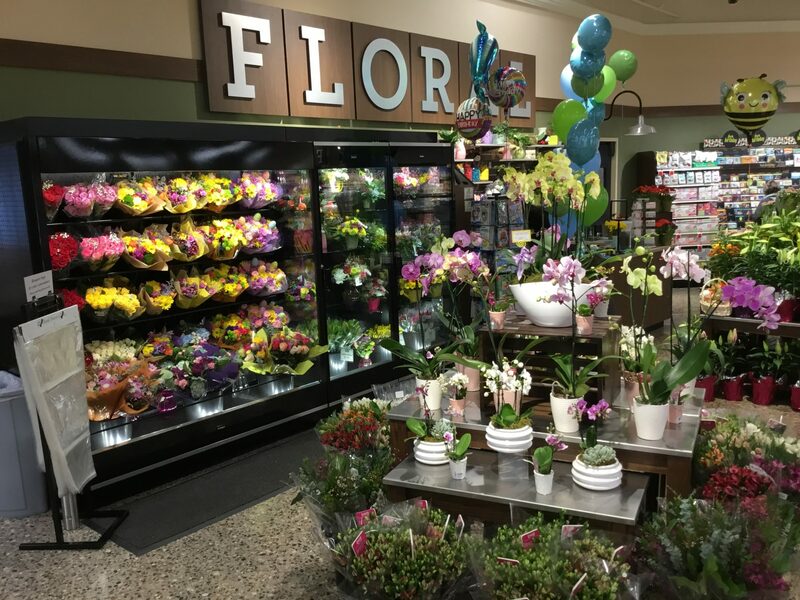 I agree with you Carol KRAUS-ANDERSON did an outstanding job on the renovation of jerry’s foods I am impressed i will need a construction company in the future when I build my new house and now I know who to call. thanks for sharing.